It’s no secret that Oregon women’s basketball has been scoring big time in the recruiting department. Their recruiting class for this year is ranked third in the nation! One of the freshmen this year is the incredibly talented Sabrina Ionesco, one of the top recruits in the country, who was USA Today’s Player of the Year and the McDonalds all-American MVP. She will undoubtedly make an impact for the Ducks this season. However, there is another recruit who is coming to play for Oregon in the fall of 2017 who should be just as impressive. Satou Sabally of Berlin, Germany, has given a verbal commitment to sign with the Ducks. The earliest possible date for Sabally to sign a letter of intent in Nov. 9, according to The Daily Emerald. 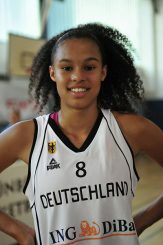 Sabally, age 19, was actually born in New York City, but has lived and played basketball in Germany for most of her life. Her current team is Eisvögal USC Freiburg. Sabally’s height and ability to drive the ball will work perfectly into the Duck’s system. Sabally, a 6’4” wing player, is a great scorer and rebounder. She has already made quite a name for herself on the international court. In the 2014 Under 16 European Championships, Sabally averaged a remarkable 20.1 points and 11.1 rebounds a game! Her stats alone through eight games are remarkable. She is now ranked number one in PPG, field goal percentage, fouls drawn, and offensive rebounds! Just to make this addition ever so sweeter, Sabally was also considering joining Oregon State before deciding to make the commitment to come play in Eugene. Salable is a great fit for the Ducks offensive system. With plenty of good forwards who can handle the ball and score, the double teams should be swarming. As the defense collapses inward toward the paint, the players can kick the ball out out to the tall guards who can knock down 3-pointers. Easier said then done, of course, but it looks like a promising system. One of those guards will be Aina Ayuso, a 5’9″ guard from Barcelona, Spain. She actually declared a verbal commitment to play with the Ducks on May 3 of this year, well before Sabally announced her decision. Right now, Ayuso is leading her team in points at 17.0 through eight games. Ayuso has also played for Team Spain in the U16 European Championships. In 2015, she lead the team in points at 9.7 per game. Both Sabally and Ayuso have voiced their excitement to not only play at a competitive NCAA level, but to use the resources and facilities meant for student-athletes. When you stop and look at the Ducks roster, it’s hard not to see the amount of young talent. Last year, Cazorla impressed a lot of people. This season, Ionesco can be a force to be reckoned with. Of course, having good, young talent doesn’t always correlate to success. Because of their inexperience playing at the collegiate level, there will probably be some learning curve for the younger players. This young roster will be more athletic, able to run the floor and should compete for years to come throughout the Pac-12.